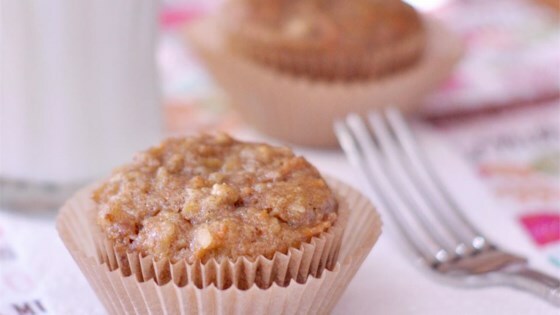 "A rich, moist muffin packed with whole wheat, oatmeal, raisins, carrots, pineapple, coconut, and a cream cheese surprise baked right in the center! Great for breakfast and kids love them! I vary the recipe depending what I have on hand and it always works out great. Hope you enjoy!" Preheat oven to 350 degrees F (175 degrees C). Lightly grease muffin tins. In a large bowl, mix the all-purpose flour, whole wheat flour, baking soda, baking powder, salt, and cinnamon. Make a well in the center of the mixture, and add white sugar, brown sugar, canola oil, eggs, and vanilla. Mix just until evenly moist. Fold in the oats, coconut, raisins, carrots, and pineapple. In a bowl, blend the reserved pineapple juice and cream cheese. Fill each muffin cup about 1/2 full with the muffin batter, reserving about 1/3 of the batter. Spoon approximately 1 teaspoon of the cream cheese mixture into the muffin cups. Top with remaining batter, so that each muffin cup is about 2/3 full.